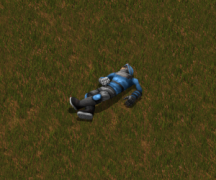 Factorio is played from the angled top down perspective of the player. The physical representation of the player is the character, who is always at the center of view. In multiplayer, player characters will appear in different colors. Color can be set manually with the /color command, see Console. These colors transfer to any entered car or tank, depending on which player is driving them. These colors also transfer to gun turrets, laser turrets or gates, depending on who they were placed by. The character is part of the player and represents the physical existence of the player in the game-world. In technical terms: A character is just one property of the player, and it is the only that can be controlled at a time. The character's maximum health is 250 (without energy shields). The character's main inventory has 80 slots (without bonuses from power armor, toolbelt research, or logistic trash slots). Similar to the stationary radar, the character constantly reveals an area of 5×5 chunks, centered on the chunk the character occupies. 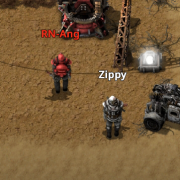 Two different color characters in multiplayer. Technically the player is only the "player-view". The player is unlike the character, (the little person that runs around on the ground) The character is part of the player, but the player is not just the character. You can for example play in god-mode (such as in the sandbox game mode). In that mode you don't have a character, only a player. In other words, the Player is a term that encompasses both the internal code that defines a player, and the entity in game that interacts with machines/rocks/trees, which is the character. While this distinction is important for modding and understanding the game's core, the terms can be used interchangeably for most conversations. For the purpose of this article, "player" will be used. Note: The player can do that only, if his character owns the abilities for this. For example: He cannot fire a weapon, cause he has no weapons-slots. When a player is killed, it leaves behind a corpse that lasts 15 minutes and contains all items that were located in the player's inventory, quickbar, trash slots, and equipment slots. 10 seconds after being killed, the player respawns at the center of the world. The quickbar is a user interface component for creating links to items that are always visible at the bottom of the screen. Once created they can be quickly selected at any time without needing to open the inventory. It shows between one and four bars from a set of ten available, each containing 10 slots. Clicking any filled slot will place the chosen item in the player's hand if available in the inventory. The shortcut bar is a group of icons for accessing regularly used features such as obtaining blueprints and deconstruction planners with a simple mouse click. It is always visible at the bottom of the screen, appearing to the right of the quickbar. The icons can be hidden and their order can be changed. A maximum of 12 icons can be visible at one time. Portrait of the player character; seen when selecting the "First steps" campaign. The player character in every type of armor. 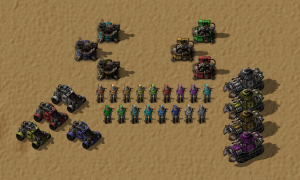 Different possible colors of players, cars, tanks, gun turrets and laser turrets. The player character's flashlight during the night. Surplus items from crafting are again available for crafting other items. For example, crafting two green circuits will no longer result in two extra copper wires in the player's inventory. This only applies to items that are automatically crafted as a prerequisite; items the player has explicitly requested to craft will not be used to satisfy the dependencies of any further orders. 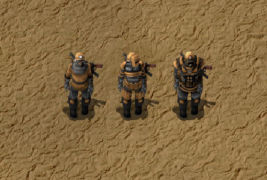 Armors have inventory size bonuses (10 for modular armor, 20 for power armor, 30 for power armor mk2). Mining a chest now fails instead of spilling items onto the ground. Player gets a separate warning icon when a building is destroyed. Recipe gui contains recipes not craftable by player (however, their tooltip shows machines where they can be crafted). Player now starts with 1 burner mining drill and one stone furnace in the freeplay. The player can repair structures using repair packs. Player moves slower while shooting. Added the ability for the player to request items directly from logistic robots. 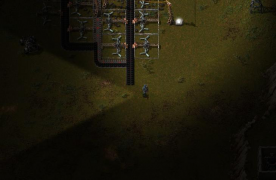 Player no longer collides with Underground belt. Added warning message when the player tries to build in an invalid position.